Hello again, and welcome to the next lesson . 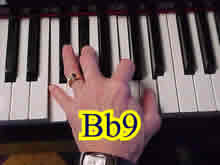 I hope you are enjoying learning about all the chords in the world -- and we're going to cover them ALL before we're done -- you'll know more about chords than 99% of the people in the world -- believe it or not, it's true. Last time we covered maj7th chords. 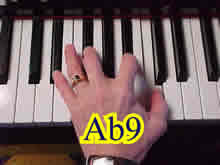 That was the last of the chords you can play without doing some fancy manuvering. 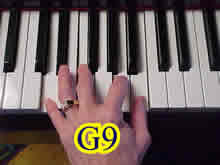 Today we're going to learn 9th chords, and from now on we will be inverting the chords and using a 2-step process to play the chords. 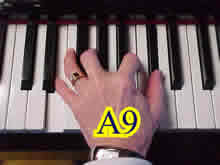 A 9th chord is made up of a root, a 3rd, a 5th, a 7th (not the maj7th -- just the 7th) plus the 9th note of the scale, which of course is the same as the 2nd note of the scale, but an octave higher. 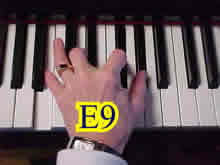 You may be saying "But how could that be a C9 chord? 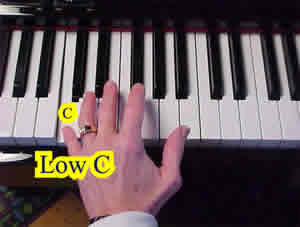 It doesn't have a C in it!" 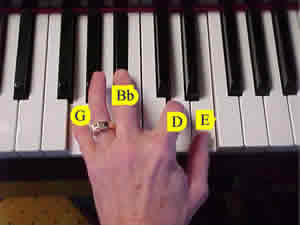 So what we need to do is to play the C -- the root of the chord -- an octave below middle C while we depress the sustain pedal, and then play the chord shown above. The sustain pedal hooks the two parts together to make one cohesive chord -- a C9. 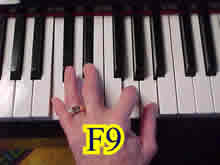 So if you want to play a F9 chord, you would play a low F (the root of the F chord) low on the keyboard, then play the F9 chord while the sustain pedal is depressed. 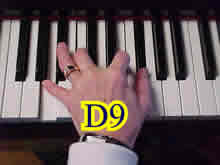 Same for any other 9th chord -- play the low root, then the chord. 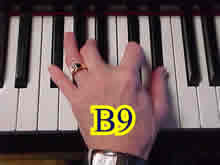 * In jazz and popular music, when the 9th is altered, the 7th is always included in the chord symbol. 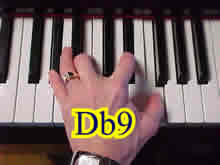 You may be wondering if you can play 9th chords in different inversions, like you can invert 6th and 7th chords. The answer is "sure" -- but if I were you I would master one inversion before trying to use several different ones. 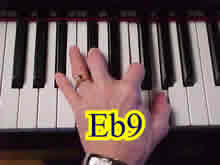 When you're dealing with this many chords, it's easy to get turned around and confused. 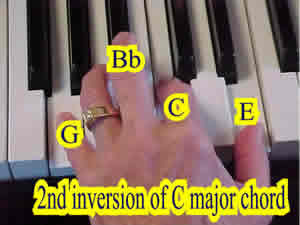 So unless you have a very good reason to use a different inversion, I would stick with only one inversion for now. Yea! Three cheers for you! 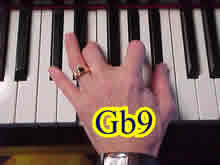 Next lesson we will add 12 more chords to our growing list of chords we can play by adding 11th chords to our stash.